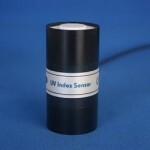 The UV Index measurement given by the sensor ranges form zero showing low risk of sunburn, to high risk values of 15+. This sensor is calibrated against a reference traceable to National Standards under full sunlight conditions, and so is ideal for long term datalogging on meteorological stations. It is fully waterproof and the output is compatible with a range of dataloggers and controllers. Each sensor is provided with a radiation response curve and Calibration Certificate.